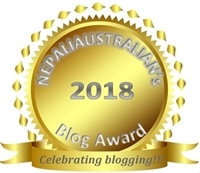 As I have mentioned in many of my posts before,Nepal has a different calendar than the Gregorian calendar. So in Nepal people also celebrate Mother’s day on a different day than the western calendar. 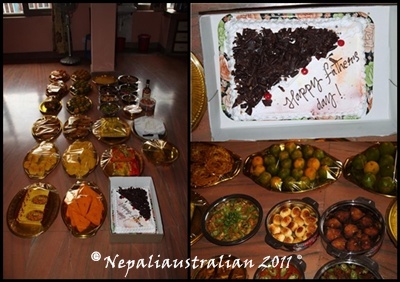 In Australia, Mother’s Day is the second Sunday of May every year but in Nepali calendar, it changes every year according to the positions of sun, moon and the planets. It falls on the last day of the dark fortnight of April or early May. This year, it happens to be on today,9 May 2013. It is commonly known as Aama ko Mukh here in Nepal. Aama ko Mukh here translates into seeing mother’s face. When I was still in Nepal, I used to make a nice breakfast and buy my mum a small present which was the only thing that I could afford with my pocket money. My dad used to buy lots of sweets as well so that there were lots of delicacies for her to eat. Mum used to make Sagun (egg, bara) for my grandma(both dad’s mum and her mum) and we used to use the same for her as well. In Nepal, if the children have left home/ married, they will come with presents and delicacies to spend time with their mother. The entire day is filled with festivities around the country. Children whose mothers have already passed away visit the place called ‘Mata-Tirtha’ which is situated at about 15 km to the west of Kathmandu or some other holy place elsewhere in Nepal to make offerings to the souls of their departed mothers. Mata means mother; tirtha means a holy place. Thus, this name suggests the holy place for them to visit for making offerings to the deceased mothers once a year. A religious festival is held at ‘Mata-Tirtha’ on the Mother’s day for a whole day. 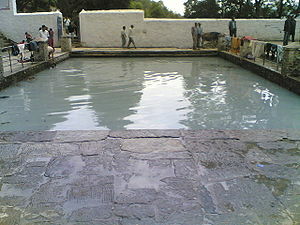 There is a legendary natural pond at ‘Mata-Tirtha’ where Nepali people pay homage to their deceased mothers. Thousands of people take a quick bath in the water flowing from the nearby stone spouts, and then they go to the holy pond to make offerings to their deceased mothers. They believe that the souls of their mothers come to this natural pond to accept their offerings on this day. 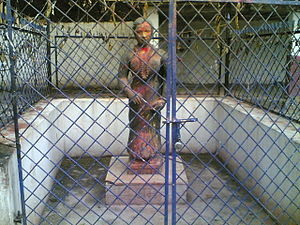 Thereafter, they worship Shiva Linga located next to the holy pond. A legend behind this day goes as follows. Shepherds used to quench their thirst with the cold water from the natural pond at the current day ‘Mata-Tirtha’ when they went to graze their cattle in a nearby forest. One day, one of the shepherds whose mother was already died happened to go to drink water from this pond she saw the image of her dead mother in the clear water of the pond. She was so excited by this that she went to every house in that village to tell them about how she had seen her mother’s image in the pond. Since then Nepali people have believed that they can see the image of their deceased mothers in the water of this holy spring. So, Nepali people from different parts of the country visit this pond on this day hoping to see the image of their departed mother. Thus, this place came to be a holy place for those who have lost their mothers. Also those who cannot go to Mata-Tirtha shower at home or take a quick dip in the water of a holy river early in the morning then offer a platter of sweets, fruits and money to a priest in the memory of their departed mother. As I have describe in my previous post , in Nepal the first year of marriage is considered to be very important. So during every festival, there are things you are meant to do. This affects how you celebrate Dashain, Tihar, Father’s Day, Mother’s day and more. Last year, I had my first Father’s day after the wedding and my MIL made sure it was a special one for my dad. This year, it is my first Mother’s Day after the wedding so it will be really special for my mum. My MIL is doing everything that she can to make sure this day is memorable for my mum. I know a few details about what is going to happen but I will wait for things to happen today and will update in details about my special Mother’s day. Just so excited to Skype with my mum later and receive photos from Nepal afterwards. So if you haven’t called you mum to wish her, do give her a call and make her smile. And to all the proud moms out there, Happy Mother’s day. This entry was posted in Nepal, Nepali Culture, Nepali Festivals and tagged Aama ko Mukh herne, Mata Tirtha, Nepali Mother’s day. Bookmark the permalink. It’s niceto to hear about all the ways people connect with mothers who have passed away, which we don’t really do in Europe for Mothers day. My mum never allowed me to give her flowers on mothers day – which is what we usually give mothers in England. She said she didn’t want me to treat her extra nicely for just one day of the year, because tradition said I should, but to be treated really affectionately all the time – so I could give her presents when the inspiration made me want to, but NOT on mothers day!!! I also like this tradition because, it will help you keep your parents’ memory alive even after when they are no longer with you. I really enjoyed this – thank you for sharing it. It sort of amazes me anyone can “get away with” following anything but the Gregorian calendar and still keep in step with the world! Very interesting post. I was impressed with Nepal. It was so fascintating, with its unique culture and natural beauty. I also loved that the holidays follow a different calendar. We were there on New Year’s Day and spent the day in Bhaktapur! It was great! I wish you mama a good life and health too. To your mother, Happy Aama ko Mukh herne. I hope you have a splendid skype conversation.